Our economic crisis is giving people a hard life that even to buy our food now is hard. Many people do not have a job and they are looking everywhere. There are many lost their homes also because they do not have money to pay the mortgage and home equity. I hope this economy is going to solve soon. 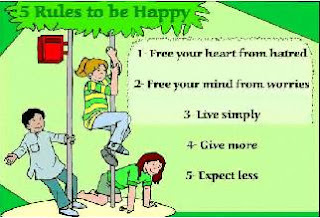 Here are the 5 rules to be happy that I want to share today.